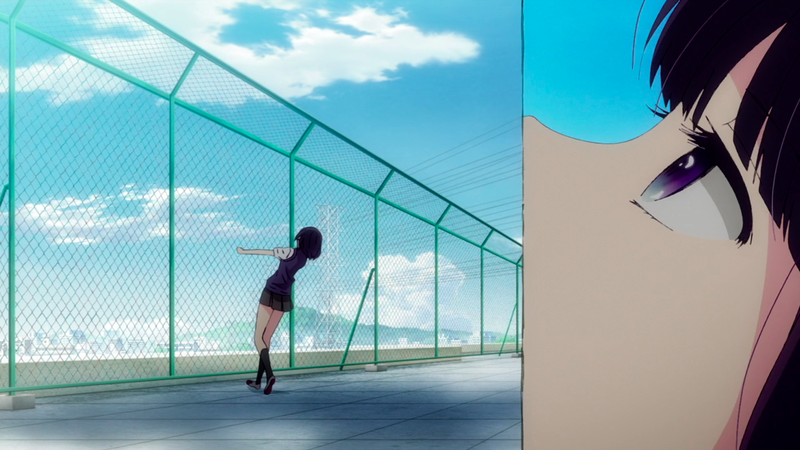 Paneling is used in anime fairly frequently, whether it’s in a stricter manga style like Masaomi Andou’s Scum’s Wish or Shouko Nakamura’s efforts in Mawaru Penguindrum (pictured above) and Doukyuusei that use backgrounds to create natural panels. Panels serve to isolate characters in specific situations, giving us further insight on their relationship with other characters in a scene, or their current mental state. The plant at Grace Field House where the children are being raised is a European-style house with a lot of clean lines and sharp angles. 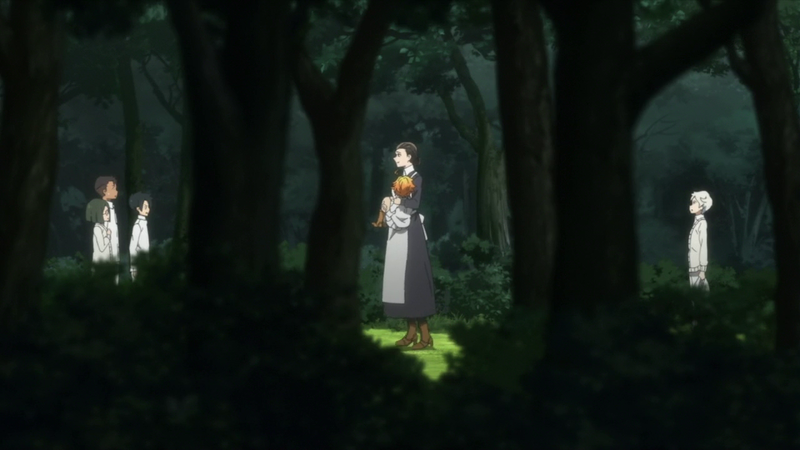 It’s a perfect background for environmental paneling, and Itai uses this to his advantage in Episode 9 of The Promised Neverland. 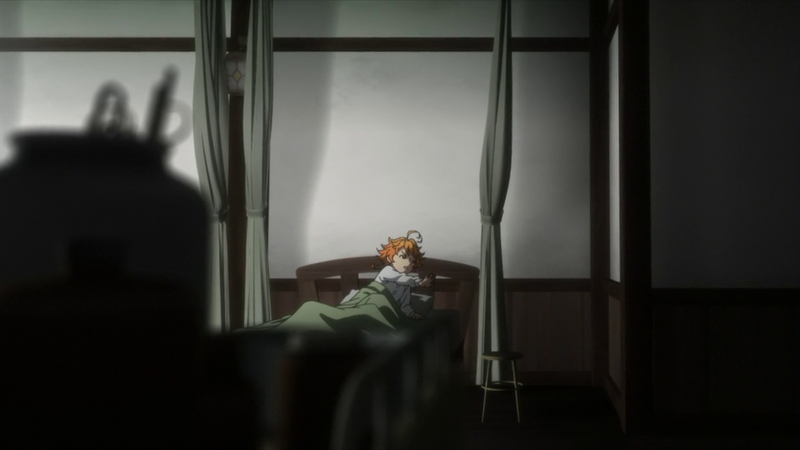 Here we see Emma lying in bed after Isabella broke her leg. We can’t see her face clearly, but through paneling, the scene isolates her. She is small due to being viewed at a distance and made to look smaller by placing her in a center “panel” created by curtains on either side. There is an out-of-focus object in the foreground in the left panel and the right contains a wall and a small stool. Having recently suffered defeat not only because of a physical injury but due to Isabella’s complete, systematic dismantling of their escape plan, Emma is at her lowest in this scene and the way she is framed by environmental panels adds to the effect while also grounding her. 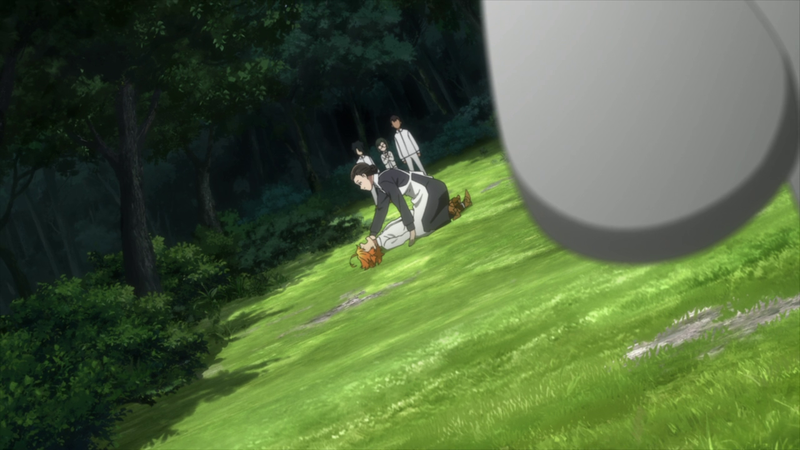 The shot is on even ground, unlike the frequent angles of the previous episode. We’re not in the surreal moments of the plan failing, but in the aftermath, while reality is setting in as the children try to regroup. 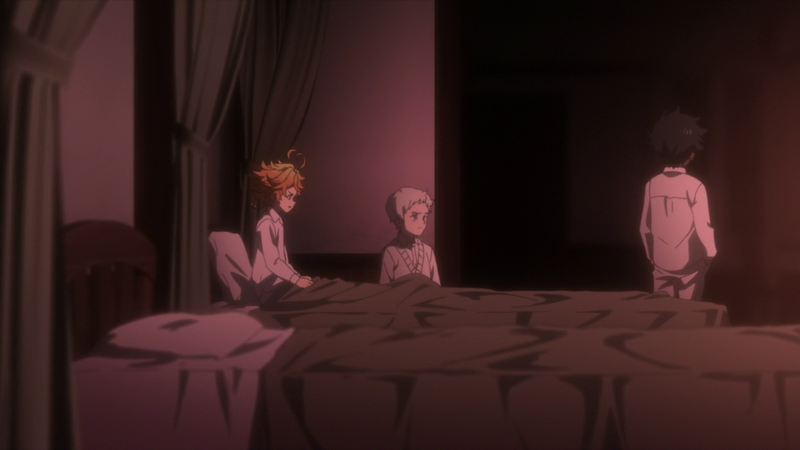 We’ll return to this curtain setup several times throughout the episode, using the same panels to isolate, unite, or create distance between certain characters. At the same time Emma is alone in bed, Norman walks the hallways of the house to bring her water. 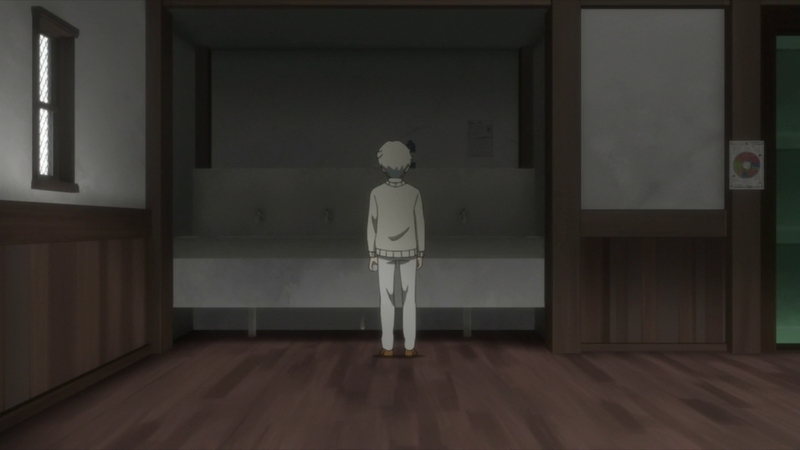 Once again, the shot is separated into three panels with the wall and window on the left, Norman at the sinks in the center, and another wall panel to the right. Like the scene with Emma, this is isolating Norman as he too is thinking through his impending shipment and death. 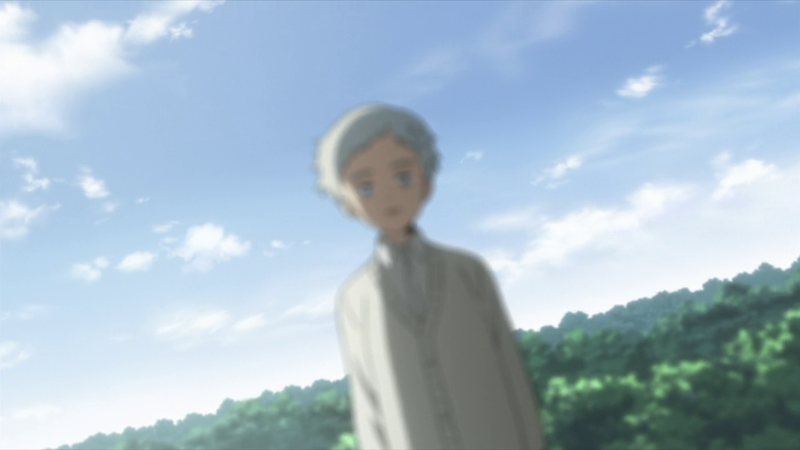 The moment that reality sets in, Norman is set off-center at an angle with a close-up of his face. It’s one of the few dutch angles used throughout the episode. All of them involve Norman. 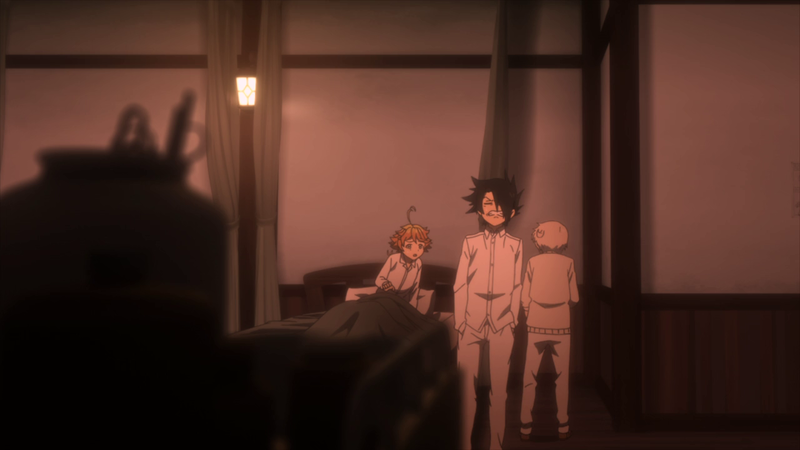 When Norman returns, he finds Ray at Emma’s bedside. The lighting shifts to a soft red tone. Here, Emma is flanked on either side by Ray and Norman, who are helping make up the center panel borders. Their positions shift as they continue to talk. 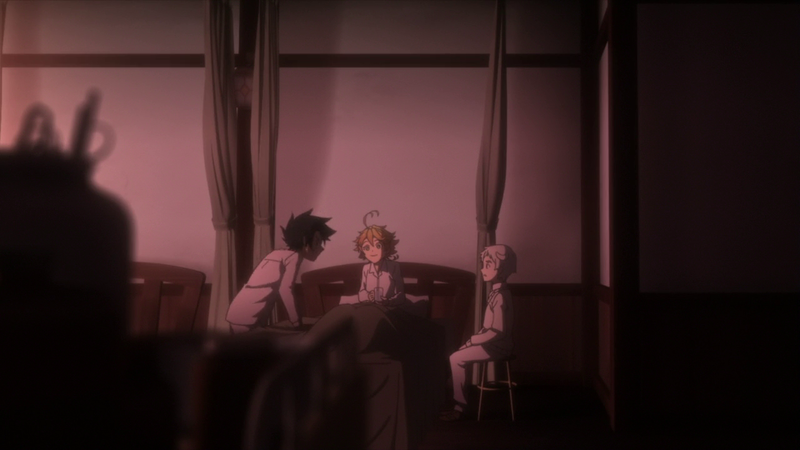 As Emma formulates a plan while Norman shoots down Ray’s idea, she’s shown on the border with the green curtain behind her as Norman is positioned in the center and Ray is separated in his own panel to the left. Throughout the episode, Itai sticks to having three environmental panels, especially when the main trio is present. 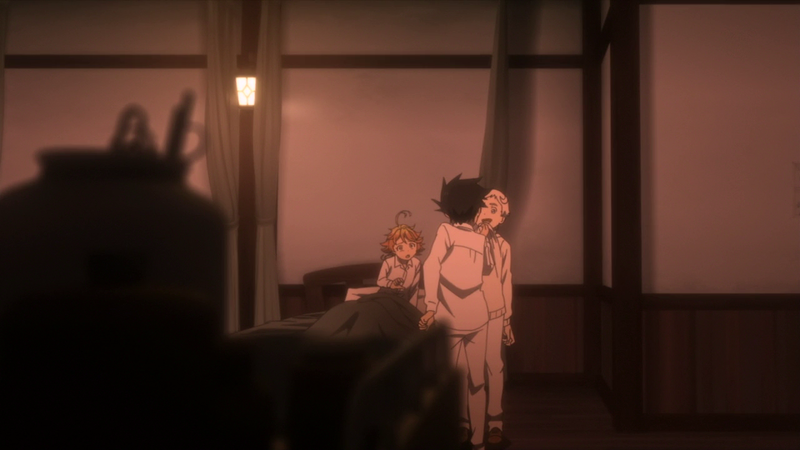 When Ray buys into Emma’s plan of breaking his own arm or falling ill to prevent being shipped out while Norman escapes, he leans into Emma’s center panel (pictured above) uniting them. Norman is still committed to dying, so he remains as part of the left panel’s border. When Norman accepts that Ray and Emma won’t let him die, all three are united in a center panel. 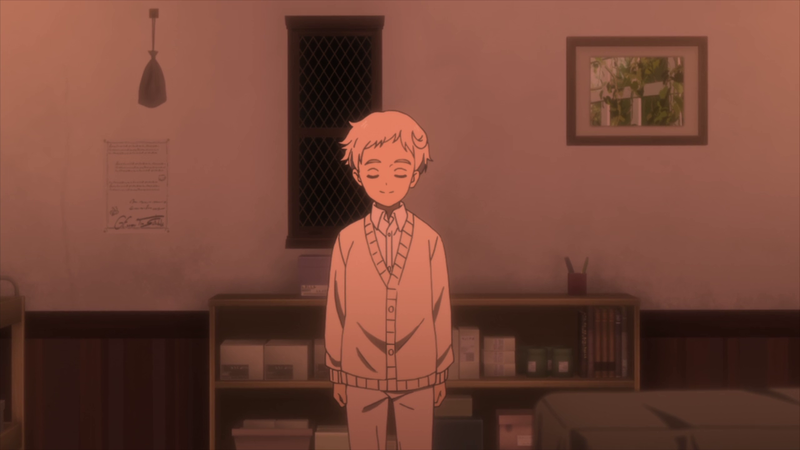 And when Ray reveals that he has memories from being a fetus onward — explaining how he knew about the nature of the world from a younger age than all of them — he is visually separated again in a dark environmental panel to the left. Emma and Norman are united in the center. 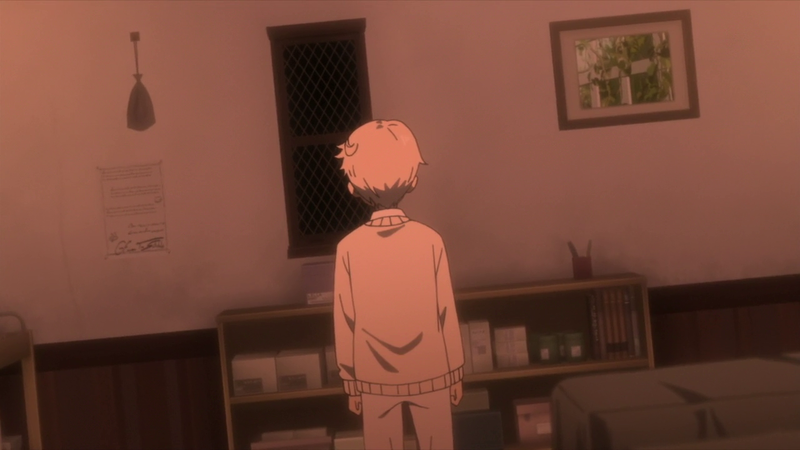 This entire setup at Emma’s bedside, panels included, is revisited once Norman returns from the wall having gathered enough information to realize that he is doomed either way. 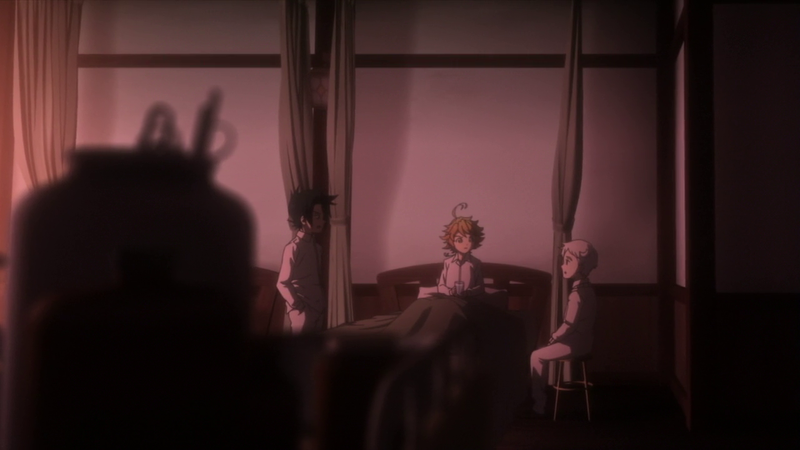 First, The Promised Neverland briefly returns to angled shots with Norman overlooking the wall to show how his thoughts have shifted. It then shows him walking back to the group — to Ray and Emma’s shock since he was supposed to disable his tracking device and escape — and siding with Isabella visually. 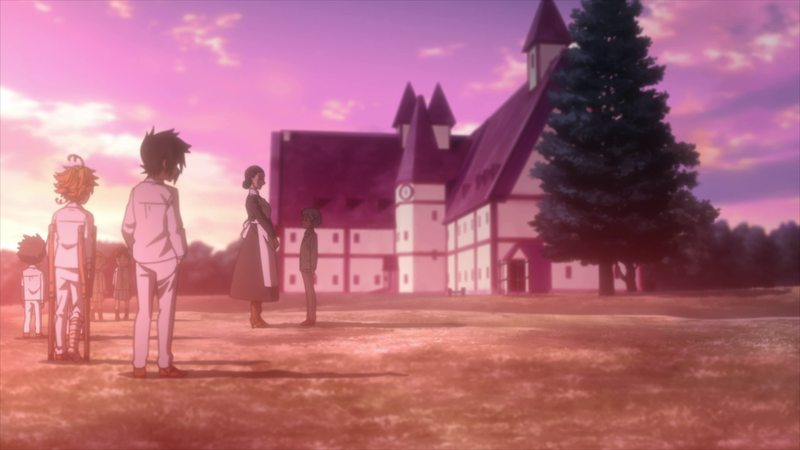 The house in the background becomes Norman’s specific backdrop in this shot while Emma and Ray are placed to the left. 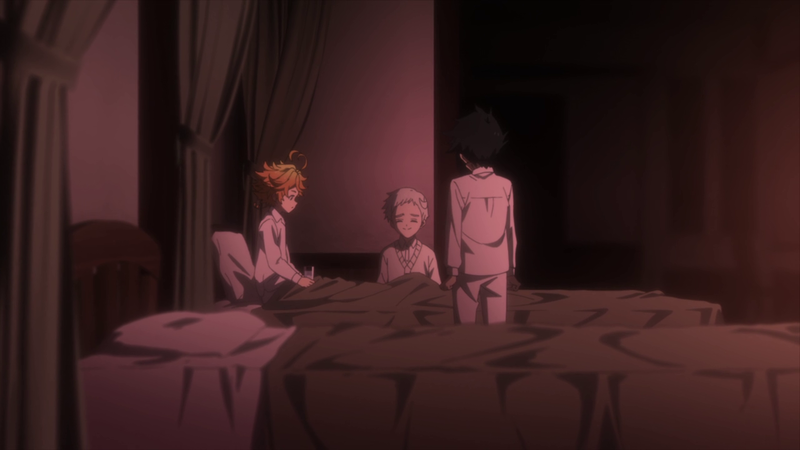 Then at Emma’s bedside, Ray leans in over Norman, questioning why he didn’t escape. The curtain has shifted, giving the scene a slightly less-grounded appearance even though it’s still shot straightforwardly. Here, Ray grabs Norman and both are messily placed at the panel border, encroaching on Emma’s center panel. Ray then pushes Norman into a separate panel. Emma still is in the center. Ray becomes the border. Norman has been exiled to the right. 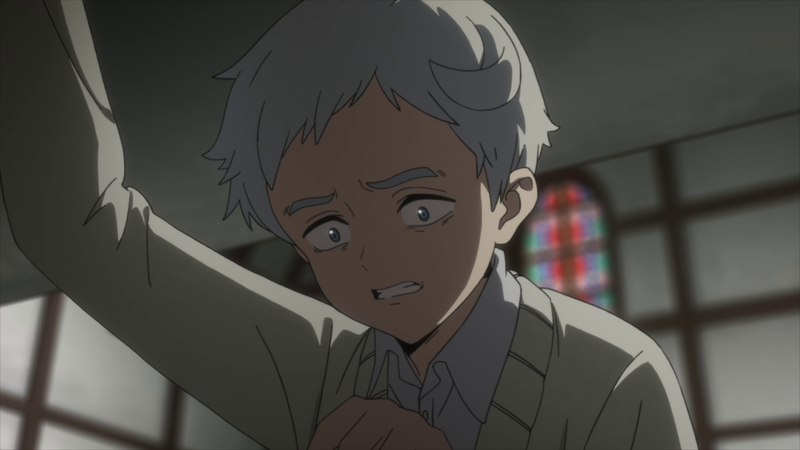 Once more, the series returns to an angled shot with Norman specifically — fitting, since he’s the one who has to accept his own death as the episode progresses. This time the camera rotates to put Norman level as he explains that beyond the wall was a cliff. 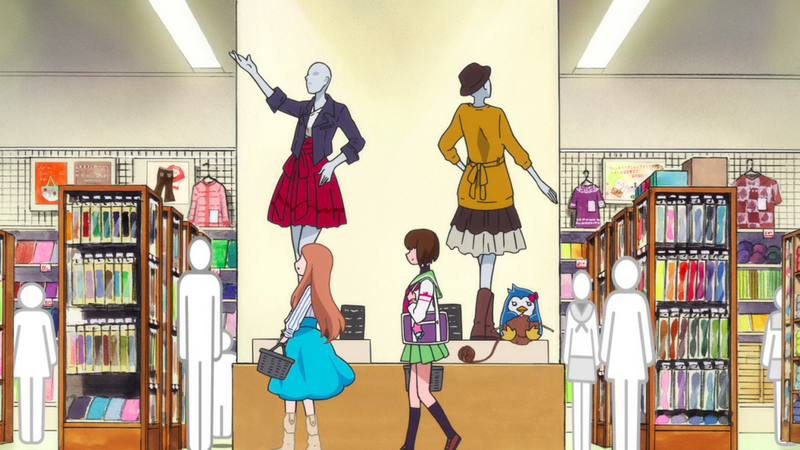 Finally, the ending shot of the episode returns to the angled looks from Episode 8. 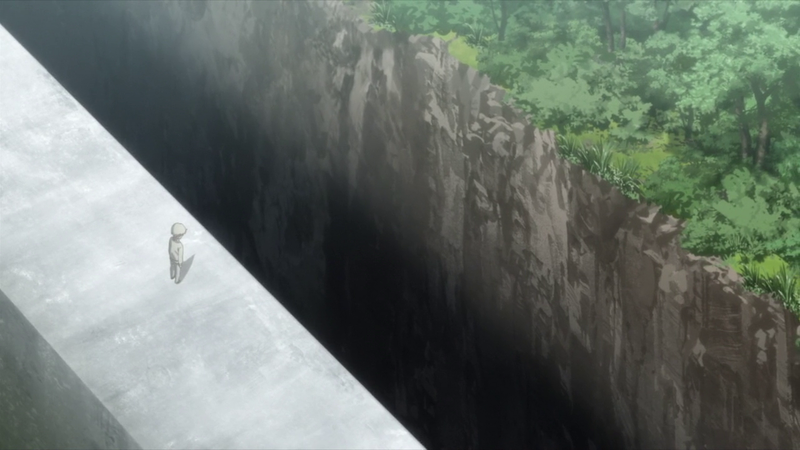 Norman stands with the cliff drawing a gigantic horizontal line that separates him from the outside world. This keeps in line with Itai’s commitment to dividing shots into thirds, but is more unsettling for its stark nature and also how it’s angled — at odds with most of the episode which is shot straightforwardly on even ground.